Oleander Poisoning is the accidental or intentional intake of the plant or plant product containing the compound. What are the Causes of Oleander Poisoning? What are the Signs and Symptoms of Oleander Poisoning? The poison is known to affect the digestive, nervous, and vascular systems. How is First Aid administered for Oleander Poisoning? Who should administer First Aid for Oleander Poisoning? 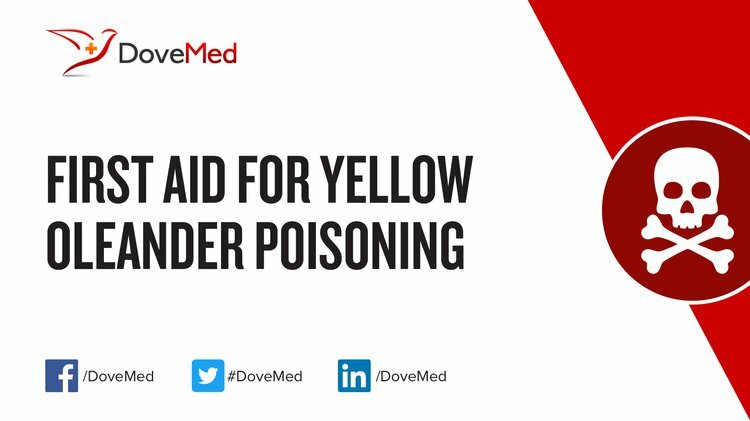 First aid for Oleander Poisoning is administered by healthcare professionals. What is the Prognosis of Oleander Poisoning? How can Oleander Poisoning be Prevented? Bandara, V., Weinstein, S. A., White, J., & Eddleston, M. (2010). A review of the natural history, toxinology, diagnosis and clinical management of Nerium oleander (common oleander) and Thevetia peruviana (yellow oleander) poisoning. Toxicon, 56(3), 273-281. Khan, I., Kant, C., Sanwaria, A., & Meena, L. (2010). Acute cardiac toxicity of nerium oleander/indicum poisoning (kaner) poisoning. Heart views: the official journal of the Gulf Heart Association, 11(3), 115. Al, B., Yarbil, P., Dogan, M., Kabul, S., & Yıldırım, C. (2010). A case of non-fatal oleander poisoning. BMJ case reports, 2010, bcr0220091573. Hameed, I. H., Jasim, H., Kareem, M. A., & Hussein, A. O. (2015). Alkaloid constitution of Nerium oleander using gas chromatography-mass spectroscopy (GC-MS). Journal of Medicinal Plants Research, 9(9), 326-334. Derwich, E., Benziane, Z., & Boukir, A. (2010). Antibacterial activity and chemical composition of the essential oil from flowers of Nerium oleander. Electronic Journal of Environmental, Agricultural & Food Chemistry, 9(6). Eddleston, M. (2013). Applied clinical pharmacology and public health in rural Asia–preventing deaths from organophosphorus pesticide and yellow oleander poisoning. British journal of clinical pharmacology, 75(5), 1175-1188. Vallé, B., Lairez, O., Gandia, P., Rouge, D., & Franchitto, N. (2012). Circuitous diagnosis in concealed self-poisoning with Nerium oleander. Clinical toxicology, 50(3), 228-229. Dasgupta, A., Klein, K., Risin, S. A., & Actor, J. K. (2011). Rapid detection of oleander poisoning by Dimension Vista digoxin assay (Flex Reagent Cartridge). Journal of clinical laboratory analysis, 25(2), 105-109.